The activity at El Hierro has brought up a lot of questions about just exactly what happens when a volcanic eruption occurs underwater — and specifically, what happens if that eruption begins to occur in shallower water. This is the realm of “hydrovolcanism” or “phreatovolcanism” — when water and magma interact, either directly or indirectly, to produce volcanic activity. In general, magma’s interaction with water comes in two flavors — phreatic, where the eruption is steam-driven, but no magma is directly involved, just heat, and phreatomagmatic, where magma is involved directly in the eruption. Phreatic eruptions don’t require a lot of water — if groundwater or snow/ice melt seeps into a volcanic edifice and heats up (typically due to a new intrusion of magma coming into the upper part of the volcano), that water can flash to steam causing an explosion (see above). 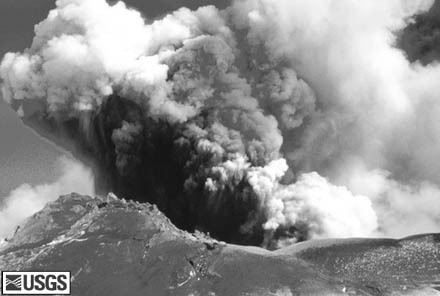 Many times, these phreatic explosions are precursors to renewed activity at a volcano. Phreatomagmatic eruptions require more water than phreatic. What happens in a phreatomagmatic eruption is usually the erupting magma is directly introduced into a body of water — possibly a crater lake, meltwater from snow or ice, seawater — and the very large contrast in heat (sometimes upwards of 1100°C between water and basalt) causes an explosion of both the water and magma. This is called fragmentation, and ash can be produced during these explosions, meaning what could have been a lava flow becomes an explosive eruption. The 2010 eruption at Eyjafjallajökull in Iceland was initially a phreatomagmatic eruption when the explosive phase started — the erupting magma came into contact with the melting icecap on the volcano and gave it extra explosive oomph — and helping Eyjafjallajökull go from being an eruption that only Icelanders and enthusiasts would note to one that brought Europe to a halt (we might term this a phreatoplinian eruption, capturing both water’s role and the height of the plume). We also saw this explosive interaction of water and magma at the 2009 eruption of Hunga Tonga-Hunga Ha`apai. 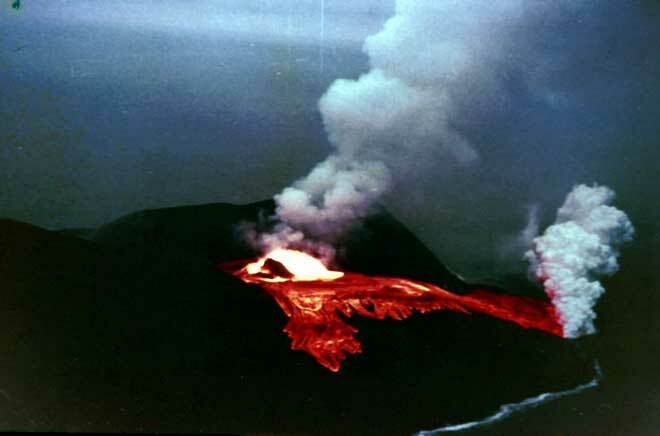 However, the eruption that gave its name to these events — the Surtseyan style of eruption* — was the 1963 eruption of Surtsey off Iceland. In that eruption, much like at El Hierro, the events began as a submarine eruption that eventually reached the surface. The most characteristic aspect of these phreatomagmatic and phreatoplinian eruptions is that the ash produced tends to be much finer in size than normal explosive eruptions that are not driven by water. In the rock record, peperites are likely the result of phreatic/phreatomagmatic eruptions as well. An aerial image of the 1963 Surtsey eruption off of Iceland. Note how the vent in the middle of the tephra cone looks very similar to the current El Hierro activity -- a zone of steam and bubbling, albeit more vigorous. Image from OSU slide collection. 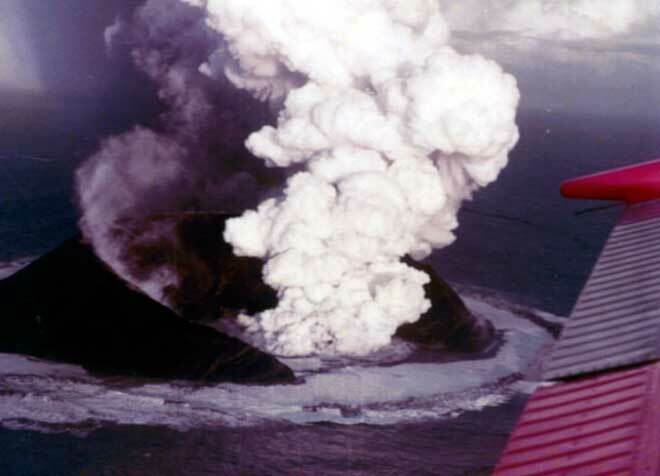 Now, why did the eruption at Surtsey (and El Hierro) need to get closer to the surface to produce an explosive eruption? That just comes down to pressure. The higher the atmospheric (or hydrologic) pressure, the harder it is for magma to fragment and cause an explosive. At surface pressures (~1000 mb or 1 ATM), the lower limit for dissolved gases needed to create an explosive eruption is 0.07 weight %. However, at 100 meters depth in the ocean (~10,000 mb or 10 ATM), that value is closer to 3 weight % dissolved gases, so it takes a lot more dissolved gases in a magma to cause fragmentation when there is increased pressure**. So, until the eruption is close enough to the surface to allow for fragmentation to occur, the eruption won’t manifest itself as anything more than stains, bubbling and debris. Once it gets close enough to the surface or dissolved gases increase, then we can start getting explosions to occur — the famous “Rooster Tails” or “Cypressoid plumes” of Surtseyan activity. However, there is some suggestion that large explosive eruptions can happen in the submarine setting — the so-called “Neptunian” eruptions — but they are not well understood. Once an island is established (and these can be quite ephemeral as they are mostly made of loose volcanic debris), then the activity might become much less explosive. At Surtsey, impressive lava flows (see below) were issued from the vent once it was closed off from intrusion by seawater. Effusive lava from erupted from Surtsey in 1963 after the vent became subaereal. Compare with the image above. Note the large steam plume on the far right where the lava meets the ocean -- another example of water-magma interaction. Image from OSU slide collection. This is, by no means, all the ways water and magma can interact, but you can at least get an idea of what we might expect from El Hierro if the eruption continues – so be sure to keep an eye on the webcams being set up at the island. ** This is why on a moon like Io you can generate volcanic plumes that are 100s of km tall — with some help from high eruptive rates and lower gravity.